Nobel laureates receive a gold medal together with a diploma and (as of 2012) 8 million SEK (roughly US$1.2 million, €0.93 million). The Nobel Prizes (Swedish: Nobelpriset, Norwegian: Nobelprisen) are prizes awarded annually by the Royal Swedish Academy of Sciences, the Swedish Academy, the Karolinska Institutet, and the Norwegian Nobel Committee to individuals and organizations who make outstanding contributions in the fields of chemistry, physics, literature, peace, and physiology or medicine. They were established by the 1895 will of Alfred Nobel, which dictates that the awards should be administered by the Nobel Foundation. The Nobel Memorial Prize in Economic Sciences was established in 1968 by the Sveriges Riksbank, the central bank of Sweden, for contributions to the field of economics. Each recipient, or "laureate", receives a gold medal, a diploma, and a sum of money, which is decided by the Nobel Foundation, yearly. 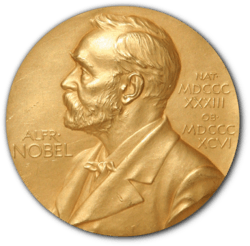 Each prize is awarded by a separate committee; the Royal Swedish Academy of Sciences awards the Prizes in Physics, Chemistry, and Economics, the Karolinska Institute awards the Prize in Physiology or Medicine, and the Norwegian Nobel Committee awards the Prize in Peace. Each recipient receives a medal, a diploma and a monetary award that has varied throughout the years. In 1901, the recipients of the first Nobel Prizes were given 150,782 SEK, which is equal to 7,731,004 SEK in December 2007. In 2008, the laureates were awarded a prize amount of 10,000,000 SEK. The awards are presented in Stockholm in an annual ceremony on December 10, the anniversary of Nobel's death. Between 1901 and 2015, the Nobel Prizes and the Nobel Memorial Prize in Economic Sciences were awarded 573 times to 900 people and organizations. With some receiving the Nobel Prize more than once, this makes a total of 870 individuals (including 822 men, 48 women) and 23 organizations. Four Nobel laureates were not permitted by their governments to accept the Nobel Prize. Adolf Hitler forbade three Germans, Richard Kuhn (Chemistry, 1938), Adolf Butenandt (Chemistry, 1939), and Gerhard Domagk (Physiology or Medicine, 1939), from accepting their Nobel Prizes, and the government of the Soviet Union pressured Boris Pasternak (Literature, 1958) to decline his award. Two Nobel laureates, Jean-Paul Sartre (Literature, 1964) and Lê Ðức Thọ (Peace, 1973), declined the award; Sartre declined the award as he declined all official honors, and Lê declined the award due to the situation Vietnam was in at the time. Six laureates have received more than one prize; of the six, the International Committee of the Red Cross has received the Nobel Peace Prize three times, more than any other. UNHCR has been awarded the Nobel Peace Prize twice. Also the Nobel Prize in Physics was awarded to John Bardeen twice, and the Nobel Prize in Chemistry to Frederick Sanger. Two laureates have been awarded twice but not in the same field: Marie Curie (Physics and Chemistry) and Linus Pauling (Chemistry and Peace). Among the 870 Nobel laureates, 48 have been women; the first woman to receive a Nobel Prize was Marie Curie, who received the Nobel Prize in Physics in 1903. She was also the first person (male or female) to be awarded two Nobel Prizes, the second award being the Nobel Prize in Chemistry, given in 1911. ↑ "Alfred Nobel – The Man Behind the Nobel Prize". Nobel Foundation. Retrieved 2008-11-27. 1 2 "The Nobel Prize". Nobel Foundation. Retrieved 2008-11-27. ↑ "The Nobel Prize Awarders". Nobel Foundation. Retrieved 2008-11-27. ↑ "The Nobel Prize Amounts". Nobel Foundation. Archived from the original on 2008-07-31. Retrieved 2008-11-27. ↑ "The Nobel Prize Award Ceremonies". Nobel Foundation. Archived from the original on 2008-08-22. Retrieved 2008-11-27. ↑ "List of All Nobel Laureates 1942". Nobel Foundation. Retrieved 2008-11-30. 1 2 Lundestad, Geir (2001-03-15). "The Nobel Peace Prize 1901-2000". Nobel Foundation. Retrieved 2008-11-30. 1 2 3 4 5 6 "Nobel Prize Facts". Nobel Foundation. Retrieved 2015-10-11. ↑ "Women Nobel Laureates". Nobel Foundation. Retrieved 2011-10-11. ↑ "2016 Nobel Prizes - Prize Announcement Dates". Nobelprize.org. Nobel Media AB 2014. Retrieved 3 October 2016. ↑ Tønnesson, Øyvind (December 1, 1999). "Mahatma Gandhi, the Missing Laureates". Nobel Foundation. Retrieved January 3, 2010. Later, there have been speculations that the committee members could have had another deceased peace worker than Gandhi in mind when they declared that there was "no suitable living candidate", namely the Swedish UN envoy to Palestine, Count Bernadotte, who was murdered in September 1948. Today, this can be ruled out; Bernadotte had not been nominated in 1948. Thus it seems reasonable to assume that Gandhi would have been invited to Oslo to receive the Nobel Peace Prize had he been alive one more year. ↑ "The Nobel Peace Prize 2010 - Presentation Speech". Nobel Foundation. Retrieved October 10, 2011.